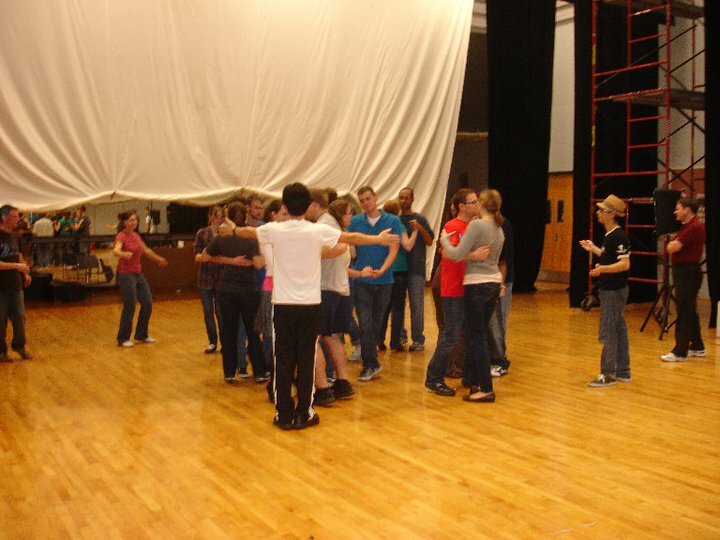 One story I have frequently encountered in the last year of my swing dance travels is individuals being thrown into the situation of teaching swing dance lessons and having to learn how to teach… while teaching. This story mainly has been encountered from individuals coming from college swing dance clubs or smaller and more isolated scenes. This trial by fire experience for some people can be often an intimidating and stressful experience. With this post I strive to create a list of suggestions and ideas for people who may have recently found out they will be teaching in the near future or those who eventually strive to teach. If Possible Teach At First With An Experienced Partner: This is not always possible, but having a mentor in most fields ranging from musicians, business, to sports have numerous benefits. Their previous experience will help you avoid pitfalls they may have encountered when first teaching and you will not have to reinvent the wheel when it comes to teaching methods. In addition your partner will likely be able to fill in gaps for moments you do not expect in a lesson due to inexperience. Take Introductory Classes Again, Except Focus on The Teaching Aspect: The first large benefit of this is it will force you go over your basics so they are clean for demonstration purposes. Second you will learn examples of visual tools such as exaggerating the wrong type of motion and verbal analogies teachers utilize in class to educate students. Learn the Opposite Role: I hold the opinion that if you only know how to lead or follow as an instructor, you are missing half the equation. It is frustrating for a student to hear, “Well I don’t know what to say, they just follow it/they just lead it”. What learning the opposite role allows you to understand what possible things can be going wrong within the lead or following of a partnership. A side benefit of this is if you are decent enough at both roles, you gain the ability to teach by yourself. Practice Being An Effective Speaker: Being a swing dance instructor is not just knowing how to dance. The way you hold yourself when you teach means a world of difference between someone who is perceived as “They know what they are doing.” versus “This person looks nervous and unsure of themselves”. This means when practicing speaking to a class you; project your voice so the whole group can hear, do not have distracting extraneous motion such as fiddling with hair/clothes, and make eye contact with students in your class. Learn the Importance of Word Choice: How your phrase things to students in your class can mean the difference between them feeling encouraged and understanding what you are trying to convey or them feeling lost and frustrated. Often with beginner/introductory level classes I try to phrase everything positively and use social reasons for motivation. I can rattle on all day about the aesthetic and technique reasons why looking down is bad for ones dancing and leads in my class will continue looking down. However if I list the two points that it you don’t want your partner to get upset when you collide into objects (social acceptance/safety) and it may be interpreted the wrong way if you are in closed position and the follow has a low cut dress (social acceptance) all the sudden most of the leads in the class don’t even fathom the thought of looking down. Get Feedback From Individuals In Your Class/Other Experienced Dancers Or Instructors: Often when teaching classes people make mistakes not intentionally but out of inexperience or situations out of their hand such as a group of students walking in 15 minutes late. While there will always be that chance of unexpected variables, feedback from all sources will help you realize your strengths and weaknesses as an instructor and allow you to fine tune your lessons. Continue to Improve Your Own Dancing: Do not fall into what I refer to as “Big fish in a little pond” syndrome. Mostly in smaller isolated scenes I notice people start teaching then immediately think they are above learning and their dancing stagnates. I am a firm believer in that students learn dance mostly visually and the better example you are, the easier it is for them to learn and the less chance they will develop bad habits they will have to fix later. Continue to Improve Your Teaching Methods: If you do step seven occasionally you will encounter in your swing dance learning perhaps better teaching models then the one you currently use for a six count basic or swingouts. Perhaps you have discovered a better analogy that gets people to not be as tense while they dance. Constantly being in the mindset of “What can I improve?” is always an effective way to becoming a better instructor. When I found out about two years ago that after a summer I was probably going to teach classes at my college, I was at first apprehensive but then I did two things that helped me out tremendously. First I took a 4-week series of beginner Lindy Hop as a follow and focused on mainly what analogies instructors used while they taught and how they demonstrated moves and concepts. Second I went up to instructors who I admired their teaching and asked them to give me a brief talk of what advice they would give to a new teacher. I feel learning from those who had experience versus attempting to figure out how to teach on my own was the most pivotal concept in learning how to teach for myself and it is the message I recommend the most to those who are new to the process. I have two blog posts related to this topic listed here and here. Otherwise if you have any thoughts or suggestions, I encourage you to post them in the comment section below. Edit: Updated Nov. 6, 2018 to have more inclusive language for followers and leaders. This entry was posted on July 5, 2011 by Apache. It was filed under Running a Scene, Teaching . The same thing happened to me with the swing club at my school. After the former instructor/club president felt burned out, I was elected to take over. I was unsure at first, but I had a partner to fill in the gaps and plenty of experience teaching other (non-dance) subjects. It was a blast, and the club became even more popular. really great post! thanks for sharing these tips. Interesting stuff.. Thanks for posting.. Thanks for sharing the information. Reading up on other beginner dancer teachers and the growing experience that they went through in order to become excellent teachers is super helpful. THe suggestions are excellent and if one applies these tips to their classes, they are going to be successful teachers. It’s also useful to look at how coaching models from other walks of life, especially sport, can be applied. The UK created a national accredited Coaching Framework several years ago that is in use in every type of sport in the UK. In it you learn the principles of lesson plans; how to demonstrate techniques in full, break them down, and then put them back together again; how to change your coaching to suit your class makeup and so on. Even a little understanding of these techniques will greatly enhance the classes you give. Interesting suggestion. I’ll look into it, thanks for the feedback!